To Sum It Up: Colin Leventhal has been fighting to hold his life together since the night his girlfriend, Sarah Evans, vanished. Everyone keeps telling him that he needs to accept that Sarah is gone and he has to move on with his life, but Colin clings to a thread of hope that she’s still alive. Meanwhile, right next door to Colin, Sarah’s younger sister, Claire, is also dealing with the loss of Sarah, mostly on her own because her parents have retreated into their own grief. Review: Sometimes you read the blurb for a book and you just know that it’s going to be a really, really good read. My instincts were 100% on the mark with This Is Sarah. It’s the type of novel your eyes and mind want to devour in a single sitting, which is totally feasible. Don’t let the book’s compact size, however, fool you into thinking that it’s short on emotional punch because by the time I finished reading it, my heart had been thoroughly hammered. And then some. Sarah Evans is the character who lends her name to the book’s title, and the impact of her disappearance on her boyfriend, Colin Leventhal, and younger sister, Claire, drives the novel. 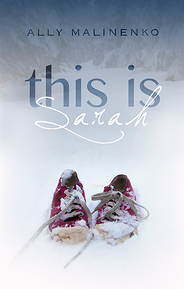 Both Colin and Claire narrate the story, and it’s through their eyes that you learn who Sarah was, the Sarah they loved and the Sarah who’s left a chasm in their hearts and lives that’s seemingly impossible to fill. Believe me when I say your own heart will break over and over again for the searing loss that Colin and Claire feel and what they experience in the aftermath of Sarah going missing. Claire practically becomes invisible to her parents, who are facing their own difficulties coping with the tragedy that has struck their family and so are not in an ideal position to offer comfort to their remaining child. As for Colin, his chapters are utterly, utterly, utterly gut-wrenching. That is not an exaggeration. His life has fractured into a billion pieces. Sarah was his world, and the absolutely desperate hope that he has that she’s alive is his only oxygen. His pain is so brutal and raw that it’s not far into the novel before you, too, hope Sarah is okay, if only to see Colin stop hurting so much. This is a young man with his whole life ahead of him who should be looking forward to going to college instead of calling his missing girlfriend’s phone multiple times a day to hear her voicemail greeting. Almost everyone around Colin—his parents, his friends—thinks he’s headed for a breakdown, if he’s not there already. As you read, you understand where their alarm comes from, yet you also see where the things he does make sense to him in his state of mind. Colin is a meticulously crafted character, as are all of the characters, and so real that it’s very easy to forget he exists in the pages of a book. This is one of the most realistic contemporary YA novels I’ve read, and that’s because of the writing. The prose in this book—it’s beautiful, bordering on poetic. Not a single word is extraneous. As somber as the tone of the book is, it never feels overwrought or cloying. Every line of dialogue sounds like it would be spoken by an actual person. In keeping with its realism, This Is Sarah doesn’t offer any easy answers, and that’s just another reason why I loved it, even as it broke the vital organ that’s responsible for that particular emotion. All in All: Just perfect. That is all. Sounds absolutely amazing. I wasn't sure of it from the synopsis like you were, but you review was very convincing. I love that the characters seem to be well developed, and I'm curious to see how the topic of grief is explored. It's something I've sadly been dealing with more as I've grown older. Thanks! I tend to stay away from books that focus on grief because the majority of the reading that I do is for escapism, but every once in a while, I'll find myself in the mood for this type of read. I really loved that this wasn't mawkish, and that you naturally just felt for the characters because they and their pain were so real. Sounds like an incredibly sad, but amazing story. The characters seem to be very wonderfully built and easy to relate to. I think it's great that the writing was so good, and even though the story-line is heart-wrenching that it is written in a way to not wreck the reader. Great review! Jaclyn @ JC's Book Haven. Contemporary novels are usually so character-driven, and the fact that these characters were so well drawn was definitely a huge factor in why I didn't want to put this book down.